"oh look how cute" came from even the most seasoned of us. But we all knew to give them a very wide berth. 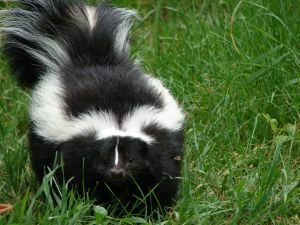 (nor as difficult to remove from dog fur and clothing) as skunk spray. that no friendly relatives are waiting to occupy the vacated dens. and not theirs to handle the problem. around your yard on a regular basis. with ammonia to cut the food smell. them and they will find another place to sleep. happy with a large and obnoxious light shining into their face. problem will be the least of your worries. having a skunk living in our immediate neighborhood.